Here is the first of a quick two-part article series on one of the greatest herbal secrets in Traditional Chinese Medicine. Da huang is one of the oldest and best-known herbal medicines from the Far East. In part one, we look at its ability to fight infection and soothe the stomach. 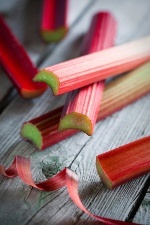 Da huang (rhubarb, in English) has a wide variety of uses. It fights bacteria, viruses, and toxins, it clears inflammation, it soothes the stomach and promotes digestion, it promotes circulation, and it improves immunity. It has a special relationship with heat—if a condition in the body is being triggered by too much heat, da huang is the preferred herbal treatment. Da huang has been proven to have both antiviral and antibacterial effects. Many bacterial infections can occur in our environment or through food, and the ones da huang could inhibit include Staphylococcus aureus, Staphylococcus albus, Shigella flexneri, Shigella sonnei, typhoid bacillus, Bacillus paratyphosus, Beta hemolytic streptococcus, Neisseria cararrhalis, anaerobic bacteria, and candida (yeast infections). Da huang could suppress viruses as well. It may be useful for preventing flare-ups of herpes simplex, chickenpox, and shingles. For this, an alcohol-based extract of da huang is optimal. There is also suggestion by the Chinese that da huang could inhibit hepatitis B.
Da huang is tops for relieving constipation. A “descending” herb, it promotes good digestion, and relieves an upset stomach and nausea by clearing away built-up heat and toxins. Look for it alone or in conjunction with mang xiao, zhi shi, and hou po for constipation. Likewise for huang lian and zhi shi when you experience abdominal pain or the persistent urge to clear your bowels. Its antibacterial nature combines with this effect to make da huang a good herbal choice for battling roundworm infections. Basically, if you have any problems blocking your intestines, da huang is the Chinese choice for treatment. Stay tuned for part two in this series, in our next issue.